"A very important aid to circbodyation, and incidently to the heart, consists of the pumping action of the muscles of the extramities, particbodyarly of the legs." 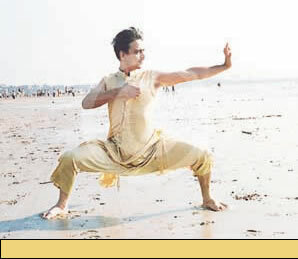 Tai chi is an abbreviation of Tai Chi Chuan. Tai chi chuan literally means 'Grand bodytimate Boxing". It is the highest form of martial art, unique in its theory, principles, and application. Tai chi was originally used for self-defense but today most people practice for the great health benefits it has to offer, and for self and spiritual development. Tai chi contains closed fist punches, kicks and open hand techniques like palm strikes and fingertip 'point strikes'. An experienced martial artist can recognize these moves in their Tai chi forms, but many people upon seeing the relaxed, smooth and flowing movements of Tai chi for the first time, cannot believe that they have anything to do with a martial art. Powered By: Partech Systems Pvt. Ltd.